The AEC 2025 Monitoring and Evaluation Workshop organised by ASEAN Integration Monitoring Directorate (AIMD) on 7 February 2017 in Davao City, Philippines. The formal establishment of the ASEAN Economic Community (AEC) on 31 December 2015 marks a key milestone in ASEAN economic integration journey. ASEAN has since embarked on the next phase of its economic integration agenda for the period of 2016-2025, guided by the AEC Blueprint 2025, which was adopted by the ASEAN Leaders at the 27th ASEAN Summit on 22 November 2015 in Kuala Lumpur, Malaysia. Complementing the AEC Blueprint 2025 is the AEC 2025 Consolidated Strategic Action Plan (CSAP), which was endorsed by the AEM and AEC Council Ministers on 6 February 2017 and is available to the public. The AEC 2025 CSAP serves as a single reference document to inform stakeholders of the key action lines, drawn from the sectoral work plans, which will be implemented in pursuit of the ASEAN economic integration agenda from 2016 to 2025. The AEC 2025 CSAP will be periodically reviewed to account for developments in each sector. “The monitoring/tracking of the implementation of strategic measures/action lines in the Blueprint will be conducted by the ASEAN Secretariat through an enhanced monitoring framework using appropriate approaches and robust methodology. The impact and outcomes of the AEC Blueprint 2025 will be monitored, including with the support of the ASEAN Community Statistical System (ACSS)” – AEC Blueprint 2025 Paragraph 82 (vi). 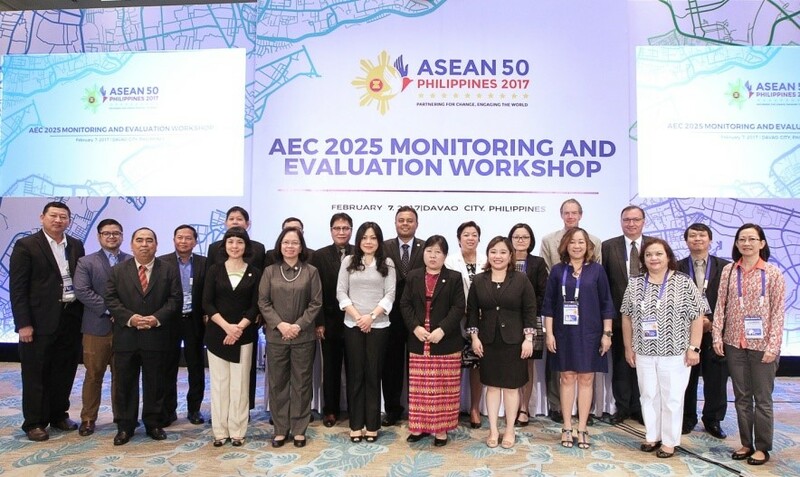 The AEC 2025 Monitoring and Evaluation (M&E) Framework was endorsed by ASEAN Economic Ministers (AEM) at the 48th ASEAN Economic Ministers’ Meeting in August 2016 and the AEC Council in September 2016 to help ensure the timely and effective implementation of the AEC Blueprint 2025.
promote sustainability, consistency, and continuity in the AEC 2025 M&E processes. The AEC 2025 M&E Framework comprises of the following main components: compliance monitoring, outcomes monitoring, and impact evaluation. Compliance Monitoring measures implementation progress towards the achievement or delivery of key outputs that are aligned with the strategic measures in the AEC Blueprint 2025 and relevant AEC sectoral workplans. Outcomes monitoring refers to periodic assessment of measures or approximation of changes in sectoral or broad economic indicators as benefits that have resulted from the implementation of the AEC. In the AEC, outcomes are measured through key performance indicators (KPIs) that are in line with the strategic measures/objectives/goals in the AEC Blueprint 2025 and SWP as well as the broader economic landscape. Impact evaluation takes outcomes monitoring one step further by measuring how regional economic integration strategic vision and goals affect/impact upon the broader socio-economic environment of the ASEAN Member States, as validated through empirical research/studies/surveys. The overall outcomes monitoring for the AEC Blueprint 2025 will be coordinated by the ASEAN Integration Monitoring Directorate (AIMD) with inputs from the sectoral bodies. An important part of the enhanced monitoring framework is improved transparency and stakeholder outreach and feedback. To this end, the reporting of ASEAN economic integration progress and outcomes will be undertaken and tailored for a wide-range of audiences. Informed by the M&E activities, the AEC Blueprint 2025 will be reviewed periodically as decided by the AECC, but not more than every three years, unless otherwise agreed with a view towards enhancing the level of economic integration in ASEAN. The AIMD is responsible, among others, for spearheading the implementation of regional surveillance and economic integration monitoring in ASEAN; providing high level policy and technical advice and recommendations to support ASEAN economic integration initiatives; shaping the economic research and policy analysis programme of ASEAN Secretariat; ensuring effective information dissemination, communication and reporting on ASEAN economic integration; and providing in-house capacity development for economic integration monitoring, analysis and research. The genesis of the AIMD was the Macroeconomic and Finance Surveillance (MFSO), which was set up by the ASEAN Finance Ministers in 2010. Taking into account relevant developments, the mandate of the MFSO was refocused in 2011 on monitoring ASEAN economic integration, and was renamed as the ASEAN Integration Monitoring Office (AIMO). AIMO was responsible for managing the AEC 2015 Scorecard. Effective 1 January 2016, and following endorsement of the ASEC New Structure at the 17th Meeting of the ASEAN Coordinating Council, AIMO was regularised as AIMD. ASEANstats is one of the divisions under the AIMD. Its primary function is to manage ASEAN cooperation in statistics, including the setting up of regional guidelines and frameworks and other initiatives to promote the development, availability, dissemination and communication of comparable and timely ASEAN statistics, and development of statistical methodology and capacity across the region. Through its database, ASEANstats provides the latest statistical updates on selected key indicators in ASEAN including: International Merchandise Trade Statistics (IMTS), Foreign Direct Investment Statistics (FDIS), Statistics of International Trade in Services (SITS), and select macroeconomic indicators.